Last box is KC06: Junction Meadow Kern River. Next box is KC02: Upper Funston Meadow #1. 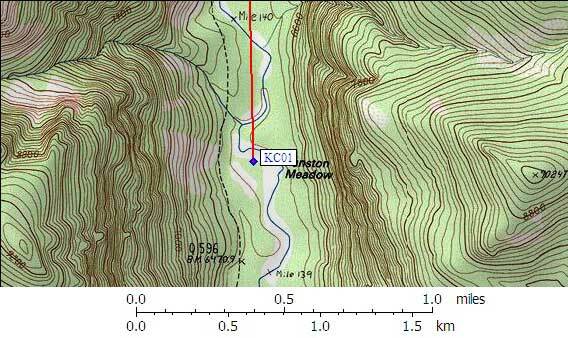 KC01 is 2 large boxes, at about 6500 feet, in the GPS route KERN CANYON. Note: This box is near where Laurel Creek joins the Kern River, south of the Big Arroyo and Rattlesnake Creek trail junction. The map does not show Lower Funston, but it does show plain old Funston Meadow about 5 miles south of Upper Funston Meadow. Follow a spur trail marked with a sign 'campsites' to the east. There is a campsite and two new style large boxes. The bear box is 200 yards east of the Kern Canyon Trail, at a campsite in the forest between the northeast corner of Lower Funston Meadow and the Kern River. Best access by stock or foot is down a steep embankment from the trail to the meadow's edge, near the SOUTH end of the meadow, then north and east along faint paths in the grass to the camping area. A prominent access route near the north end of Lower Funston Meadow is usually wet and boggy. (lat,lon) = (36.3824700, -118.4102400) in decimal degrees, NAD83. (zone,east,north) = (11S, 373591.0, 4027099.0) in decimal meters, NAD27.